37 years ago - Lois Lane is born on an army base, the daughter of General Sam Lane. ​29 years ago - 12-year-old Lois befriends Titano, an infant ape being reared as a test animal by the army. 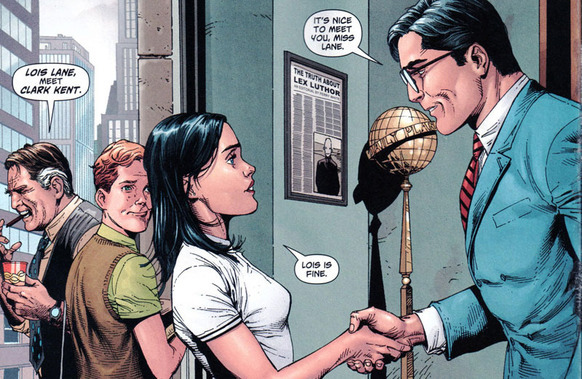 19 years ago - 18-year-old Lois Lane studies journalism at Metropolis University. 15 years ago - 22-year-old Lois Lane graduates and is hired by the Daily Planet, quickly establishing herself as formidable reporter. She -goes out with Metropolis man-of-the-year Lex Luthor. 13 years ago - 24-year-old Lois Lane meets Clark Kent. She writes the first story about Superman, coining the name. 7 years ago - 30-year-old Lois Lane learns that Clark Kent is Superman. She meets ​6-year-old Krypto, and helps Clark calm Titano when he is mutated by Gorilla Grodd. 5 years ago - 32-year-old Lois Lane watches Clark Kent 'die' saving Metropolis from Doomsday. Reveals that she knows Clark's identity to his parents. She is nearly tricked into accepting that Cyborg Superman is actually Clark, but is ultimately able to see through the lie. She is eventually reconnected to Clark. 4 years ago - 33-year-old Lois Lane and Clark Kent are married. ​ Mr. Mxyzptlk appears a week before the wedding wedding to torment them, but ultimately he wishes them well. now - While taking 37-year-old Lois on a trip across the galaxy, Superman is caught by General Zod & Mongul. They are taken prisoner on Warworld. ​Mr. Mxyzptlk appears on Warworld during their imprisonment, taunting them with false rescues. Lois has come through a pretty ridiculous crucible of being "superman's girlfriend" through decades of misogyny so thoroughly institutionalized that we're still in the process of realizing it was even there, and come out the other end a pretty badass character. There was a longstanding effort to remove her marriage to Clark from continuity, something that finally came to pass in the new 52... but for the life of me, I could never figure out why. It's such a fantastic way to strengthen and humanize Clark. In many ways their relationship is the fulcrum his character turns on. If there's any part of her story that's ridiculous to swallow, it's the idea that such a brilliant and fearless reporter somehow managed to miss that Clark and Superman were the same person for so long. You can craft explanations all day, but they always come across insulting. My favorite explanation is that she's a woman who has strong instincts and who trusts those instincts implicitly, so while she would sometimes see some glimmer of Superman behind Clark's glasses and his slouch and his clumsiness, her instincts still told her that these were two different men; one was a friend and rival and coworker, and the other was a glorified ideal that was so perfect he was barely a person. That idea at least sounds like something a person might do, that they would separate their feelings about people like that. Coupled with all the work Clark does to differentiate his separate identities, you can almost buy that she missed it. Almost. Moving the story forward, I'd like to see Lois and Clark have a child. All the fan questions about how a human woman could carry a Kryptonian child could become cannon, and in the end, Superman would be a father, and we'd get to see him undergo all the self discovery and personal growth that comes with parenthood. It's clearly the next step.